Earlier this year, we decided to initiate sales and marketing efforts with a focus on UX projects. Before we could start, we needed to get a better handle on who to target. We love creating research-based personas based on customer interviews and field studies. But we wanted to get something in place that 1) used a team sport approach, and 2) took only a few hours of each team member’s time. So we decided to create lean personas based on 2 rounds of internal surveys plus some discussion. Our goals were to 1) get what was in people’s heads down on paper, and 2) reach some initial consensus on the most promising targets. Here’s what we did and what we learned. What is the Stakeholder’s #1 pain point that caused them to look for a consultant or agency? How has the Stakeholder / team been trying to solve these pain points to date? Before sending it out, I asked for a volunteer from the team and ran a usability test of the survey. Via screen sharing I watched him read and respond to each question, thinking aloud as he went. Soon enough, it became clear that some of the questions and instructions were confusing, and that there were opportunities to drop some questions and add others. I revised the survey and sent it out to the full team. I reviewed all of the survey responses and saw that, if we focused on the questions around the primary stakeholder and their boss, we had the potential for a good mix of customer profiles, or rough personas. I couldn’t just share the raw survey responses as it would have been overwhelming. Instead I picked out 12 key questions and pulled the responses for those same questions for each team member. I did some minor cutting from any particularly long responses to get all of the profiles to a similar length. Finally I gave each persona a title composed of a gender-neutral name, their role and their company size. 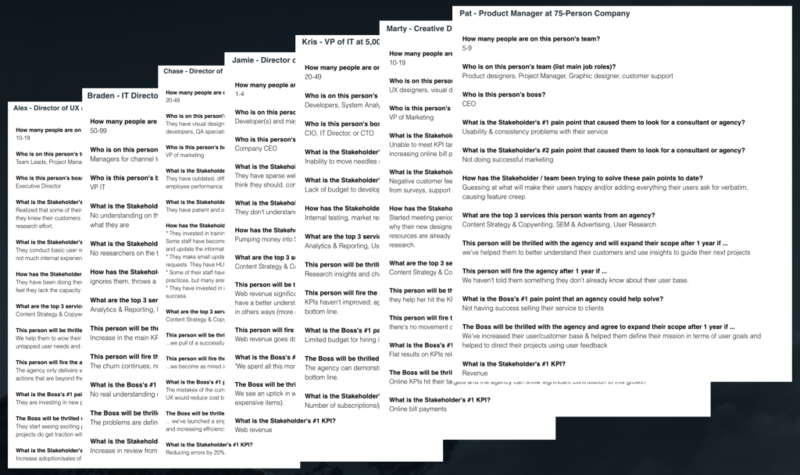 Next I created a follow-up survey where team members would read and rate each profile statement, answer some questions, and give final rankings at the end. The goal was to reach quick consensus on the most promising, most desirable personas. As you can see from the instructions above, I was asking people to process a lot of information, and give feedback on it, in a short amount of time. I didn’t want people to have to click back and forth between the survey and another document containing the personas as they were answering questions. I wanted something more seamless. By using SurveyMonkey’s page description field, I was able to insert each persona into a separate page of the survey, placing the questions about that persona right below it. We got together for a virtual meeting and spent the first half of it filling out the survey individually. I then pulled up the survey results and quickly walked through them. We ended with some open discussion. In the final rankings, Chase came out on top, followed by Alex. I had asked people not to rank the profile they wrote #1. For me and for others I heard from, this turned out to be unnecessary; we were more excited about other profiles than the ones we’d written. 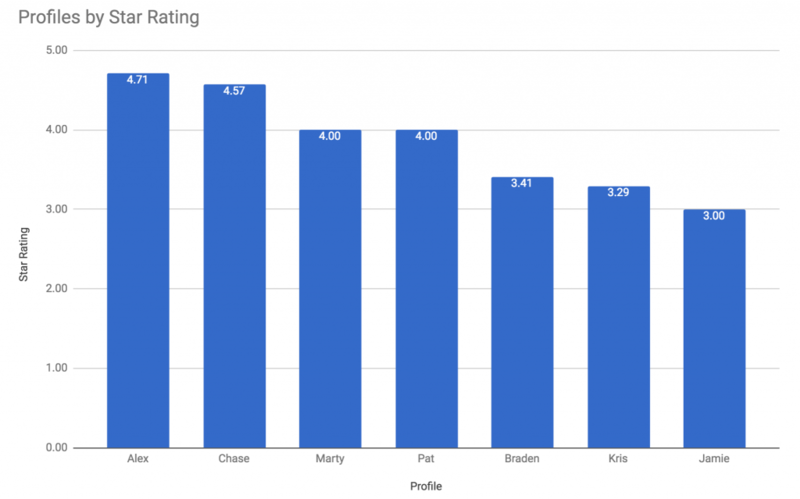 The final rankings differed some from the average star ratings (how people rated each profile immediately after reading it), but the same 2 profiles came out on top. How many people are on this person’s team? Who is on this person’s team (list main job roles)? They have visual designers, content specialists, UX specialists, front-end developers, back-end developers, QA specialists, and product managers. Who is this person’s boss? They have outdated, difficult to use internal systems that lead to errors in patient care and inefficiencies in employee performance. What is the Stakeholder’s #2 pain point that caused them to look for a consultant or agency? They have patient and organizational data in multiple, disparate systems. * They invested in training people to use the disparate, hard-to-use systems rather than in updating them. Some staff have become experts in navigating the various systems to do their jobs; others struggle to find and update the information they need. * They make small updates to various systems on an ongoing, ad hoc basis based on internal customer requests. They have HUGE backlog of such requests. * Some of their staff have dabbled in UX principles, so some of the updates are consistent with UX best practices, but many aren’t. * They have invested in rewriting much of the microcopy in an effort to improve usability with some success. What are the top 3 services this person wants from an agency? …we pull of a successful merging of their internal systems into one, well-designed, highly usable system. …we become as mired in their internal bureaucracy as they are, and can’t get anything done as a result. What is the Boss’s #1 pain point that an agency could help solve? The mistakes of the current systems affect the company’s bottom line. Integrating and fixing the systems’ UX would reduce cost by cutting down on rework. … we’ve launched a single, integrated system that is already showing signs of reducing mistakes by 20% and increasing efficiency (by their measures) by 15%. What is the Stakeholder’s #1 KPI? Realized that some of their recent initiatives weren’t landing with customers; led them to question whether they knew their customers as well as they thought they did. Want to take a step back for a large-ish scale research effort. They conduct basic user research internally and grasp the value of UX, but have a limited UX toolbelt and not much internal experience beyond basic interviews and usability testing. They have been doing their own research into new UX methodologies and considering trying them out, but feel they lack the capacity and experience. We help them to wow their boss, showing an unprecedented level of user understanding, and a new list of untapped user needs and goals, leading to potential (validated) new product ideas. The agency only delivers what they feel they could have accomplished internally, or only recommends actions that are beyond the current scope or unrealistic. Increase adoption/sales of new products and services by existing users. We left our discussion excited to begin putting our new lean personas into action. 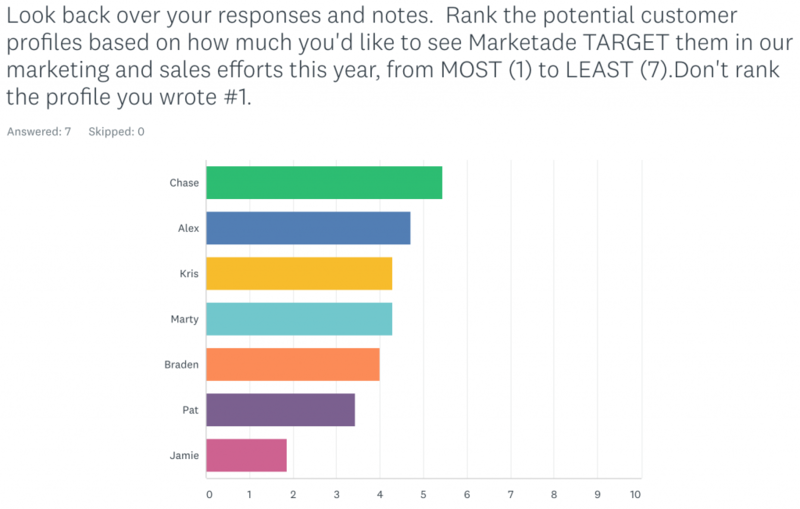 Prior to this exercise, we lacked alignment on who to target, and this was causing me to hesitate and spin my wheels on content and marketing efforts. Almost immediately, the personas provided the motivation and focal point we needed to get moving. 1. Blog Posts Targeting Personas. In the 3 years prior to our persona exercise, we’d written only 1 blog post. In the 30 days after, we published 8 posts. Most of them are case studies written with a persona’s particular pain point or goal in mind, including a post on IA research targeting Alex, and a post on “How User Research Made the Marketing Director a Genius” targeting Chase. 2. Homepage Targeting Personas. Within a couple hours, we used Google Optimize to create a variation of our homepage with a different headline and intro paragraph. We launched this new persona-focused homepage through an A/B test against our existing page. With qualified leads as the measure of success, the new homepage has a 90% probability to beat the old homepage according to Optimize. 3. AdWords Campaign Targeting Personas. We launched a national paid search marketing campaign through Google AdWords, with 200 keywords across 24 ad groups. The campaign targets people like Chase and Alex who are searching on targeted phrases like “usability testing companies” or “ux research agency”. We continually referred back to our persona statements when writing the ad copy and building out the campaign. The early results are promising. We received 400% more qualified UX leads in the last month than we received all of last year, spending only $1,000 a month. Encouraged by our progress so far, we’re now working on an MVP of a new, expanded website targeting Chase and Alex — with new service pages, team bios and more. Once that’s live, we’ll conduct some usability tests and user interviews to in/validate and improve both our new designs and our initial personas. Since they were based largely on internal assumptions rather than in-depth research, we know there’s plenty of room to improve our personas. Yet our initial results show that they were enough to get us moving in the right direction. As Tom Peters likes to say: ready, fire, aim!